1983. I'm the cute baby of course. 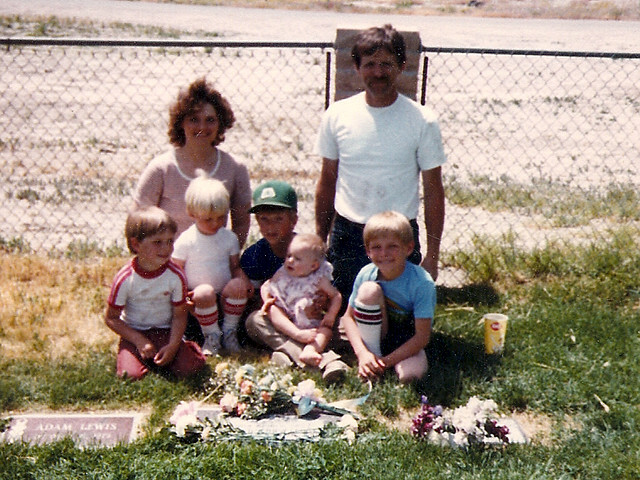 Every year on Memorial Day my mother would gather flowers and we would visit the cemetery as a family. Most of the time we would meet my grandparents, aunts, uncles, and cousins there. It was always a grand procession cars, people, and bored children. 1988. Lewis kids minus one. Bored much? 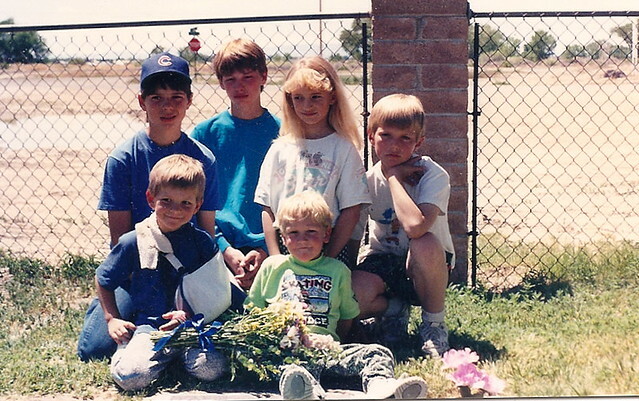 We would place flowers on the headstones of family members. Most of them just names to me of people that I had heard of but never met. There would be two bouquets reserved for babies that my mom lost shortly after their births. My dad would take out a pocketknife and clean up the overgrown grass around the headstone and we would sit there a minute before proceeding to the next area. Usually the weekend would also include a grand Hyde BBQ or a campout at Lake Lahontan with the Lewis'. Memorial Day weekend was the defining moment of summer's arrival, my approaching birthday, and many days to come camping, boating, floating the river, swimming, and playing outside with cousins and friends. I've always wanted traditions like this for my kids, but sadly when you move 9+ times in 9 years of marriage it just doesn't happen. My friend Rach invited us over to ride ponies on Saturday and I about died. What?!? Really? Then Sunday night we camped out at Beaver Lake next to our friends. The kids rode their dad's longboards up and down the road, hotdogs were roasted, bocce was played, Easy busted out his new hammock, and my girls learned how to catch things on fire with a magnifying glass. Even little Rosie slept pretty soundly for us in the tent with the crickets chirping all night. Yesterday the older girls attended their first swimming lesson of the summer and to all of our surprise they absolutly loved it. Yes summer is here! And with camping, swimming, BBQing, and good times I guess it's not too far off my own childhood memories. Except, of course, for the ponies. Haley! I just stopped by your blog for the first time in awhile and I just wanted to say how beautiful your family is (as always :) and that I love reading about your little adventures. You inspire me! What a fun week! I love the pony pictures and hearing about your camping trip. I wish we lived closer to relative's graves we could visit on Memorial day too. I can't wait for your marathon trip across the country. You can do it for sure!! !